Karachi, Aug 27, 2018: Procter & Gamble (P&G) has continued its commitment to provide clean drinking water to communities in Karachi during the summer through the P&G Children's Safe Drinking Water program. Over 4 million liters of water, treated with P&G Purifier of Water sachets, will be made available to people in need in urban slum communities of Karachi through P&G's long-term NGO partner HOPE. With temperatures rising to 40° C every year and several heat wave cycles already, it is predicted that the heat waves in future will be much more intense than in previous years. Problems of contaminated water persist in nearly all segments of the society, especially in the slum areas which leads to illnesses such as dysentery, diarrhea, typhoid, cholera and gastroenteritis. This makes the need for clean drinking water even more critical during the summer. 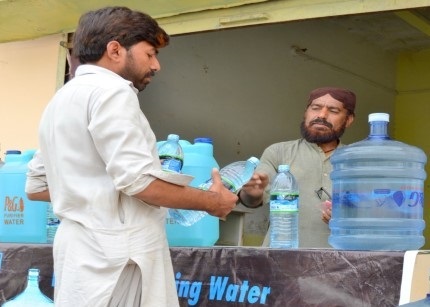 For the fourth consecutive year, P&G has launched its treated water program reaching people in slum areas of Karachi where the water supply is erratic and contaminated. P&G Purifier of Water stalls will be setup at multiple locations, making water treated via P&G Purifier of Water sachets available at an affordable cost to these communities. Education on hygiene will be an integral component of the program. Each outlet is estimated to produce 60,000 liters of water per month and distribute an additional 13,200 P&G Purifier of Water sachets per month. During the course of this project, it is estimated that over 4 million liters of clean drinking water will be made available to families in these areas through an estimated reach of over 33,000 visitors. Over the past three years the program has made available over 12 million liters of clean drinking water through an estimated reach of over 72,000 visitors. To the millions of people in the world who don't have it, the power of clean water is health. To the children who miss school each day because of illnesses, the power of clean water is an education. And to families, the power of clean water is economic opportunity-and a chance to live a better life. Through the P&G Children's Safe Drinking Water (CSDW) Program, P&G is committed to long-term, not-for-profit provision of clean water in the developing world in an effort to reduce illness and death, particularly in children. CSDW provides P&G Purifier of Water sachets through community-based social markets and in emergency-relief situations. During the last 13 years, working with a wide range of more than 150 advocacy and implementing partners, the P&G CSDW program has provided clean drinking water in more than 90 countries. More than 13 billion liters of purified drinking water have been provided helping save thousands of lives, and helping empower women and girls. To date, more than 876 million liters of clean drinking water have been provided to Pakistani communities in need through this program. This is enough to provide nearly 5.7 million people with clean drinking water for 3 months. P&G's Children's Safe Drinking Water is one way the Company demonstrates it is committed to impacting communities around the world and working to be a force for good and a force for growth. P&G is committed to delivering 15 billion liters of clean drinking water by 2020 - by expanding CSDW's reach, P&G is committed to fight the world water crisis, in partnership with NGOs, companies and consumers. In collaboration with the U.S. Centre for Disease Control and Prevention, P&G has developed a low-cost powder technology, which has been specifically designed to purify drinking water as per World Health Organization standards. A 4 gram P&G Purifier of Water sachet treats 10 liters of water by effectively killing bacteria and viruses and removing parasites and solid materials.